This coming weekend our crossFit coach Linsey is getting married (to an Aggie what what). 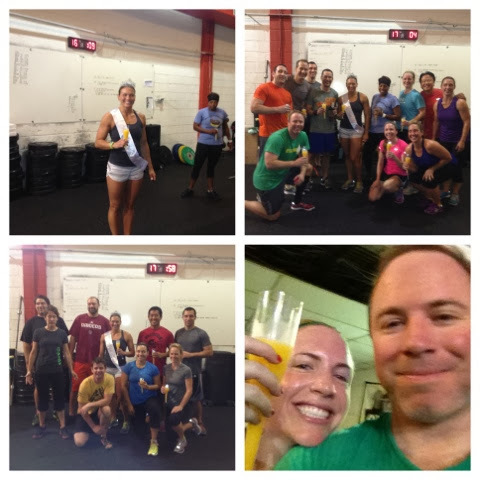 In honor of her nuptials, the morning crew decided to throw her a surprise bridal shower..crossfit style. What is a CrossFit Bridal Shower you ask? Well it involves completing a WOD and then surprising the bride-to-be with a sparkly crown and sash of course! Donuts and Mimosas are must too. Who doesn't want champagne after sweating at 5:30am? I can't take credit for any of the planning/executing of the surprise. Josh and I just showed up, but our fellow CF friends went all out with champagne flutes and Dunkin' Donuts. Yum! Congratulations Linsey! We are so happy for you and the CFA Morning Crew will miss you in November. I think we might have to come visit you at CFFC so we don't get withdrawals. Like I have said before (in a gazillion posts) the social aspect of crossfit is my favorite thing! Oh how fun! Working out then mimosas sounds fabulous!